Unequal Gains offers a radically new understanding of the economic evolution of the United States, providing a complete picture of the uneven progress of America from colonial times to today. While other economic historians base their accounts on American wealth, Peter Lindert and Jeffrey Williamson focus instead on income-and the result is a bold reassessment of the American economic experience. America has been exceptional in its rising inequality after an egalitarian start, but not in its long-run growth. America had already achieved world income leadership by 1700, not just in the twentieth century as is commonly thought. Long before independence, American colonists enjoyed higher living standards than Britain-and America's income advantage today is no greater than it was three hundred years ago. But that advantage was lost during the Revolution, lost again during the Civil War, and lost a third time during the Great Depression, though it was regained after each crisis. 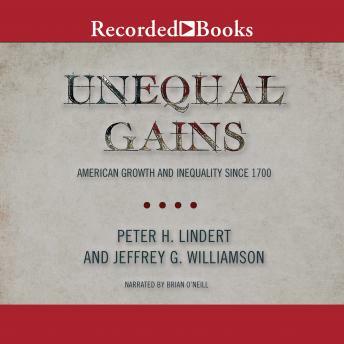 In addition, Lindert and Williamson show how income inequality among Americans rose steeply in two great waves-from 1774 to 1860 and from the 1970s to today-rising more than in any other wealthy nation in the world. Unequal Gains also demonstrates how the widening income gaps have always touched every social group, from the richest to the poorest. The book sheds critical light on the forces that shaped American income history, and situates that history in a broad global context. Economic writing at its most stimulating, Unequal Gains provides a vitally needed perspective on who has benefited most from American growth, and why.